200 George Street is a Mirvac development located along George Street CBD with the access to the site via Underwood Street. 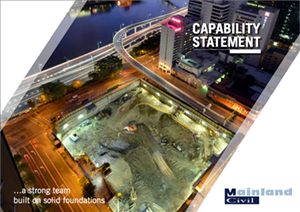 Mainland Civil’s scope of works included shoring, detail, forming, reinforcing and concreting footings and slabs. The 15,000m3 of sandstone excavation had to be excavated and removed within the tight confines of surrounding CBD buildings with strict noise and vibration limitations. As part of the DA conditions, it was necessary to remove 4500m3 of yellow block sandstone using quarrying techniques. Excavation of yellow block was undertaken using excavators with diamond saw attachments to cut the sandstone up into rectangular blocks which were then trucked to offsite quarries for further processing for use by the public works for the City of Sydney building restoration works.